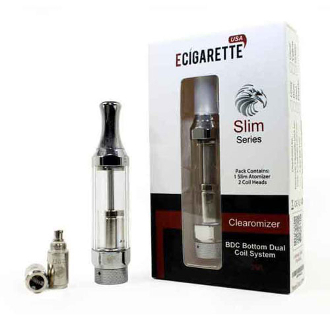 The Slim clearomizer is a great new dual coil bottom clearomizer that has a unique hexagonal shape and a sturdy clear plastic tank that comes in a variety of colors It can be disassembled and rebuilt which gives you the capability of not only cleaning your clearomizer but also removing burned out wicks and replacing them. It is also eGo 510 threaded which makes it a versatile clearomizer that will fit on any eGo battery. This combo comes with 2 extra dual coil wicks and 1 slim series clearomizer to ensure that you have a replacement if your current wick burns out. We do recommend picking up several more to keep yourself stocked up. .Screw the bottom assembly back onto tube. *Wicks have an average lifespan between 10 to 20 days and are dependent on the amount of vaping. When the wicks wear down, it may begin to leak and can/will taste burnt.